You are here: Home > T-Mobile To Release Samsung Galaxy Mini, T-Mobile Move? T-Mobile To Release Samsung Galaxy Mini, T-Mobile Move? While there are some mixed reports floating around as to which of these two devices T-Mobile is launching, Phonescoop confirms the Samsung Galaxy Mini will be coming stateside soon. Before you get all kinds of excited this isn’t exactly a top end device and it definitely doesn’t play in the same league as say, the upcoming Galaxy S 4G. That’s not to say the Galaxy Mini is a bad or cheap phone and Phonescoop points out it certainly doesn’t feel low-quality, but it’s a mid-range Android device and you’ll know that when you see it. The Galaxy S mini sports a 3.2″ touchscreen, 600 MHz processor, 150 MB of internal storage with microSDHC expandability and Android 2.2. Rumor has it from T-Mobile we’ll be seeing this device on contract for anywhere between the $50-$75 range, falling in line with CEO Philip Humm’s desire to see plenty of Android devices fall below the $100 mark. On a secondary note comes the T-Mobile Move, which as first reported by PCWorld is coming to T-Mobile. However Phonescoop dug a little further taking to the T-Mobile folks in Barcelona and reports it is in fact NOT coming our way. We’ll hold out for some official word from T-Mobile, however the “most affordable Android device,” sports Android 2.2 along with a 2.8″ 320 x 240 display, a 2 megapixel camera, 150MB of internal storage and microSDHC support. If this phone didn’t come to T-Mobile, I don’t see many hearts breaking. Image courtesy of Phonescoop, head on over there for a small gallery of shots! ← T-Mobile Dropping Flexpay, Returning To Deposit Based System? I’d like to see a small, affordable 2.8in display, Android 2.2 phone with a horizontal physical keyboard slider come to T-Mobile. It’s gotta be cute…for younger teen generation it’ll be an awesome seller…especially among teen girls. You’re being too nice. This is not last gen. I don’t see this mini as being an upgrade from the my G1. yup, a last gen phone that was just revealed a few days ago. not every phone has to be top of the line you know. You know what???? You are absolutely right that the phone is not last gen….its worse than that!!! You’re also right again…not every phone has to be top of the line…..BUT not every phone has to be low end as well, especially considering that the low-end users probably don’t even care about the tech world and will be just fine with whatever phone they have already (even when their contract is up). Lol. You do realize that people like you are never happy with anything that have, even when it is EXACTLY what you said you wanted?! SO SHUT UP! What are you even talking about JCJ???? Who said that they weren’t happy with their device??? It definitely wasn’t me, so unfortunately your comment doesn’t make any sense and carries no weight. Way to fail bub. Lol. I love the fact that T-Mobile is appealing to the folks who want smartphones but don’t need superphones. With affordable rate plans, and affordable web plans, it makes it more appealing to families. Especially to families with teenagers. Truth is there are more parents out there who would like for their kids to have a smartphone but can’t afford the heavy duty pricing of them. Oh dear God its the Behold 3. This thing is right on par with the the MyTouch 3G from 2009. They aren’t thinking about everyone. Thats why the Pyramid is so highly desired right now. There’s already a hand full of “Standard” smartphones that don’t require a $30 data plan so Its not like this phone is one of the first. There is a whole department of Android phones that T-Mobile is avoiding which is the Large Android phones. If all Tmobile carried was “Premium” smartphones then the people who want a lower end smartphone would be understandably bitter. They are NOT thinking about everyone. Oh yeah and people do care, you just don’t. My sentiments exactly…people also don’t understand that if certain customers don’t care about all the bells and whistles, that probably means that they won’t care about the low-end Android offerings either. Why is this so??? Because they don’t care!!!!! Lol. Even though I’m perfectly fine with my G2 (got it rooted and running over a 1Ghz….smooth as butter and my battery lasts a long time too), the high end users have a legitimate reason to be upset. Everything Tmobile has is now close to midrange with what’s on the immediate horizon. Even Tmobile selling the Vibrant 4G is a ripoff with the Galaxy S2 announced. Get it together Tmobile. Smh. Thank you. Key thing you said there was “close to midrange with what’s on the immediate horizon”. The only KNOWN things we have on the Horizon is like you said the V4G and also the Sidekick 4G. I gotta admit though its gotta be even worse to be on Sprint LOL. All they got comin is the Kyocera ECHO. get what together, they do what they do to accommodate all people and their budgets, not cater to the whiners who want everything for nothing. Yes other carriers have phone slightly better, but do you wanna pay a premium for them just cause they are ATT, Sprint or Verizon??? Once again retard…..I’m not whining and I LOVE my phone. My arguments are defending high end users who see nothing but kiddie phones coming out. Had to get that disclaimer out there, so now let’s move on. You said it yourself that other carriers are getting slightly better phones even though their customers are paying premiums. What you fail to realize is that Tmobile customers are paying PREMIUMS for slightly UNDER-POWERED phones. In essence, Tmobile is killing their own profits. Not everyone who is a Tmobile customer has a family and is stuck with a strict budget. I guarantee you that they have customers who will drop $600 right now for a superphone that’s blowing the competition away, for the sheer fact that no one has it. Of course Tmobile doesn’t care about profits, so they’ll release phones like this and then worry why everyone is either leaving or why they are stuck in fourth place. Even though I’m HAPPY with my device, they need to get it together. You might not but it’s good to educate the people whom might not know that this UNDER spec’ed device will never be upgraded. EVER! This thing might be okay to the regular Joe for the first 5 minutes they demo it in the store but once the get home and find out you can’t install and run 90% of the games and apps on the market then it gives both Android and T-Mobile a bad. The Optimus T at $30 is much better than this phone at $50. Right? I got an Optimus T in my pocket right now that I got off Craigs yesterday for my moms. My test run has been quite impressive. I had one too, until I bricked it trying to flash a ROM. The Optimus T is a great phone and quite impressive, especially the battery life., but I couldn’t pass up a free G2 for adding a line online. It would be one thing to pick up low to midrange phones , IF you had 2-3 powerhouse phones to counteract it. But they dont with none confirmed on the roadmap. While everyone else has dual cores confirmed. T Mobiles president Philipp Humm stated they are going to focus on keeping smart phones cheap under $200.00 by focusing on mid-range to low-end smart phones. I hope they at least get some high-end phones like the Samsung Galaxy S2 and the HTC Pyramid to accommodate customers who are looking for high-end devices. AT&T just released 2 sweet looking HTC Androids a few days ago. Well then I see no need for you to even be reading this article let alone be on this website…. idiots. so, he’s not allowed to browse and make an informed decision on what to do with HIS money? what country are we in? I love people who get tweaked out over a different opinion. Have fun att, my friends who have att cant wait to leave simply because the lack of updating their phones. Also att is one on the worse for bogging their phones down with bloatware. I even had one friend whose att phone was defective, it would randomly power off, and even shock him every once on a while. Att told him it was a manufacture defect and he would have to take the issue up with the manufacture. Yes, it will be attacked via a pink ribbon to a binkie. What cracks me up is that Tmobile wants to make a stab at business accounts yet all they release are kiddie phones. Have been a loyal Tmobile customer for 11yrs(powetel<voicestream<tmobile), and have been your greatest defender at times. Listen to me, you have to step your game up. If people are going to spend $30 a mth on a data plan, they would like to use it on one the hottest phones. The time is now Tmobile, the people are ready, waiting, and praying that you step to plate with something we can be proud of. You don't need a full array of super smartphone but aleast two or three fully spec'd out for choice. Right now we are having to compromise. Have flash and ffc but smaller screen or nice screen but no flash or ffc, but never the peanut butter and jelly together…..lol. For the the first time I am considering taking my three line, three data package family plan somewhere else. Please give me a reason to stay. I’ll say this from now on when it comes to anything samsung! F#ck you samsung!i hope t mo get the xperia play if not I’m out! By by! Not asking your opinion clown! Oh god if it doesn’t have a 8″ screen, double-super-amoled and a 5.6ghz quad processor that massages your back and does your laundry everyone cries about leaving. Well, bye! No one here will miss you guys. there is more to the phone world then this TINY sector of tech geeks who want top gear. Face it, there are still people using 8-10 year old flip phones because all they want to do is occasionally…gee, make a phone call?? I know, the horror. Tmobile offers more android devices then any other carrier, so guess what, that means they are going ot carry the entire spectrum from low to high end. THe G2 IS a high end device, if you took the crayon scribbled MyTouch logo off the MT4G, then it would be in line with every other non-perfect rectangle phone but its specs. There will likely be high end LG, Samsung and HTC phones on the way. But guess what, NOT EVERYONE NEEDS A SUPER PHONE! Kids, people who want to try out a smart phone, people who are not tech savy….are they supposed to be left out in the rain? I’m gonna keep whining and complaining until TMO produces large phones like VZW ATT and Sprint are. Have you SEEN the success the EVO has had!? That thing is outdated and still sells like hotcakes. Imagine the success TMO could have right now with the Pyramid on its line up. My friend you can have your little beep beep phones as there are a handfull for you to choose from already. funny thing is, the evo may be lightning fast, but it’s internet is driving downtown during lunch hour. 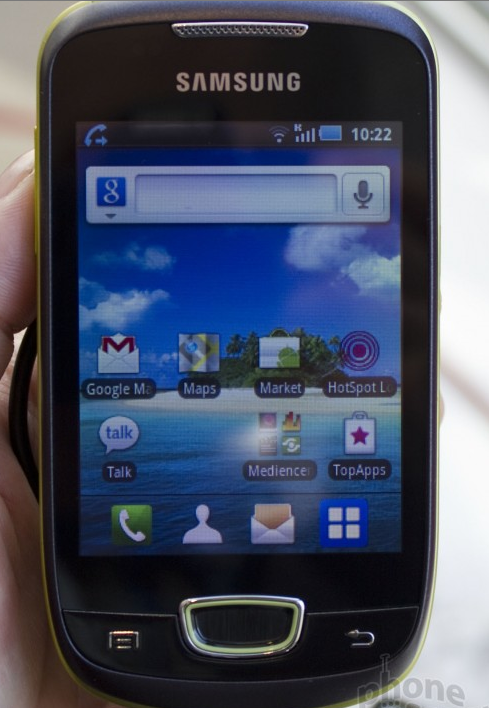 mytouch 4g is .5 inches smaller, every bit as fast and faster on the net. the funny thing is, the limelight of a “super phone” is not that long, and the phones are expensive. so if tmobile got one, it would only be 5-6 months before you started crying again. the point being, people act like t-mobile is light years behind everyone in phones, and it isn’t the case. not everyone wants a 4.3″ screen. not everyone cares if there is a FFC or not. not everyone needs to have a dual core processor (hell, computers still are just now taking advantage of multi-cored processors for everyday applications). however, these are all expensive things to add to a phone. a good phone has a good lifespan and the company will be able to sell it at a decent price and customers will be happy. what advantage is there to make a phone available that only 10% of the market demands? sure, you have the loudest voice, but that doesn’t make you right. the happy customers don’t have a loud voice cause they don’t need one. Boy this is getting old. So why are the big 3 all carrying these oversized superphones if its such a bad idea to carry them? Also why are we in 4th place? we are in 4th place for a multitude of reasons. no one has left because t-mobile doesn’t have good phones unless it is merely people like yourself that put it in peoples heads that they are. the 4g and G2 are both high end and serve all the needs of the majority, the only thing you can say that other phones have over it is one thing, screen size. but, can you do wifi calling on the evo? can you do video calling on the iphone 4 outside of wifi coverage? can you surf the web at even close to the speeds on any of the “superphones” as you can with the g2 or mytouch 4g? more to the point people leave t-mobile due to the fact of poor indoor coverage, which is caused due to the high mhz rating on the network. i believe it was a bit over 20%. number 2 reason was cost of service or “value”. the third reason was phones, which again i put more to perception than reality. people flock to the next great iphone, which has nothing more to offer than a good android phone, and they aren’t any more reliable. of the 10% or less customers leave over phones 90% are for the iphone, not the droid, evo, epic, or incredible. the reason phone companies carry them is for the awe factor. it makes for great advertising and brings people to the stores. i am not denying that having a “superphone” wouldn’t create buzz with tmobile. however, the only phone released at the moment that carries weight is the iphone. outside of enthusiasts, how many people know evo, incredible, epic, or droid by name? if anything people know droid due to the massive amount of advertising, but not from anything else. An enthusiast does not represent the majority. We do have high end devices (MyTouch 4g, G2, HD7, etc.). Just because every phone is not a $500 retail valued phone does not make it “Junk”. It gives options for customers who want something nice, but nothing too expensive (IE: The majority, more than likely not you). As a sales rep, will I use this phone? No (I’m in love with my G2). Will the average person who wants a smart phone, but weighs other things (be it from hobbies, bills, whatever) higher than a phone will want this device? Yes. This device will be able to go on the Android Market Place, Take Photos, Take Video, Have Widgets and other customizable icons. Screen Resolution, LED Flash, Keyboards are an extra bonus you pay for. My hopes is that it’ll be able to perform with the likes of the Optimus-T. Optimus-T is what I consider the cream of the crop for mid-range that T-Mo has released thus far. (I will give some props to the Defy, but ugh, I hate Motoblur.) It does the above mentioned tasks extremely well while being modestly priced. Bought my moms an Optimus T because I felt the same way about it. Since a lot of my back and forth with people is about carrying an “EVO/DROID X” type of phone, I’ll ask you how successful IS the HD7 in your store and how much more successful do you suppose it would be if it was an Android based phone? I’ve never seen one person holding an HD7 but 3 of my friends own an EVO and I’ve ran into a hand full of others. For the record I completely understand that Optimus T type phones and this Mini Samsung are the meat and potatoes of ANY carrier. I will never say that a Superphone is more important than a midranger but I will say that Big Superphones now have a huge presence in the industry. Does anybody know if T-MO will get the HP PRE 3? God, I hope so! T-Mo needs to stop carrying crap like this! So we went from the flooding of crappy Samsung flip phones to a little baby Samsung smartphone. Third place, here we come! will this require a data plan? if not its a pretty good idea.. Some people are so CHEAP! Yes, it will require a data plan! It’s android! Wow, idiot.